Schwartz & Wade, 9780375868658, 40pp. Do you know your letters? Can you count to twenty? Learn all that and more in this all-in-one concept picture book. Perfect for kids heading to kindergarten, this book covers the alphabet, counting, opposites, shapes, colors, and seasons. Award winning author-illustrator Valorie Fisher uses bright, gorgeous photos of retro toys to illustrate these topics in a completely fresh way. Parents will love this stylish and funny approach to basic concepts, while kids will learn, well, everything. Valorie Fisher is the author-illustrator of When Ruby Tried to Grow Candy and How High Can a Dinosaur Count?, which received two starred reviews. She is illustrator of The Fantastic 5 & 10¢ Store and the photographer for the beloved Moxy Maxwell books. Her titles My Big Brother and My Big Sister, both Oppenheim Toy Portfolio Platinum Award winners, were also illustrated with photographs. Ms. Fisher's photos can be seen in major museum collections around the world, including the Brooklyn Museum, London's Victoria and Albert Museum, and the Bibliotheque Nationale in Paris. 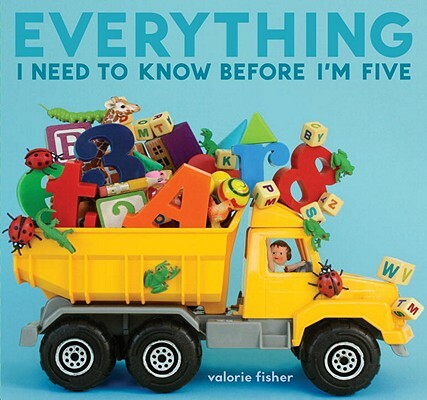 "Fisher (The Fantastic 5 & 10¢ Store) gives preschoolers a leg up on need-to-know information in this energetic collection." "There's a faint haziness in Ms. Fisher's photographic style that gives her tableaux a sugared quality; you feel vaguely that you ought to be able to pluck the objects off the page and eat them."